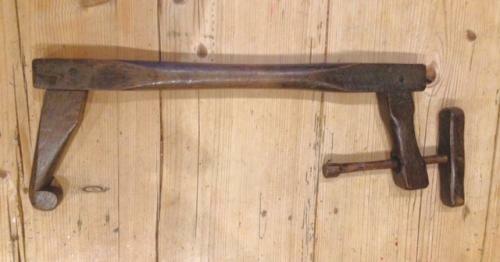 Fine 19th cent Wimbrel, Wimble, Scud Winder (Suffolk), Throw Hook. Used to make straw string for tieing the sheaves of corn or for thatching rooves and hay Ricks. These early examples were beautifully made by farm workers. This one is in oak and all joints are wooden pegs. The Wimble needed two people to operate. One feeding in the twisted straw while the other did the winding.